It was all but a sure thing that Samsung would take the covers off the newest addition to the Galaxy Note family this week at Mobile World Congress in Barcelona. Which is why we’re excited to see that as of this evening they’ve done exactly that. Samsung unwrapped the Galaxy Note 10.1 this time last year so it’s fitting that their unveiling yet another addition to the Note lineup with a new 8″ model. 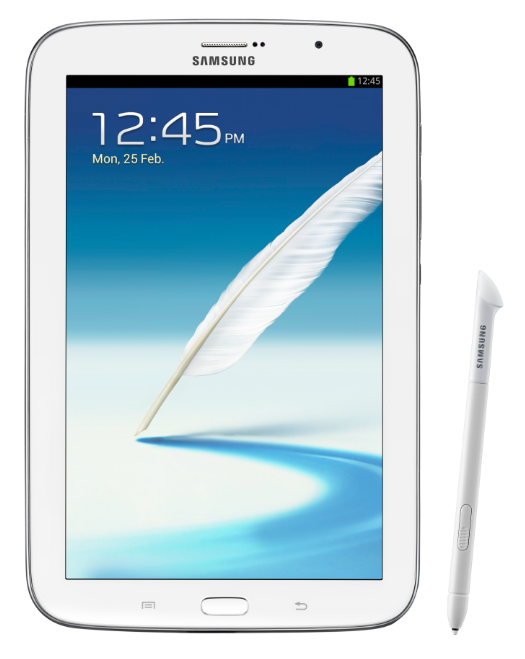 The new Galaxy Note 8.0 will sit firmly in the Note lineup against the 5.5″ Note II and larger 10.1″ Galaxy Note. For some, 7″ tablets are just a tad small and 10″ tablets a little too large which makes it fitting that Samsung would introduce a model that sits comfortably in-between. Ultimately, Samsung won’t knock your socks off with the spec sheet as the Note 8.0 features a 1280 x 800 display, quad-core Exynos processor clocked at 1.6GHz, 2GB of RAM, 5 megapixel rear camera, 1.2 megapixel front-facing camera and 16GB or 32GB internal memory with microSD expansion. The Note 8.0 is packed into a 7.95mm body weighing in at 338grams and its available in the very same glossy plastic body Samsung fans either love or hate. However, early hands on reports show terrific performance, especially inside the web browser — an app notoriously hung up by underpowered hardware. The Note 8.0 is equipped with Android 4.1.2 Jelly Bean and adds a number of new features and apps including a bump in the S Pen hover feature to work with third-party apps. A new version of Android will ship first with the Note 8.0 and allow you to hover over your Flipboard tiles and see a brief preview of headlines. Perhaps one of the more minor additions will also be one of the most notable as Samsung has equipped the Note 8.0 with an integrated earpiece, microphone and phone app. The Multiview feature that has helped make the Note II so popular is on board along with a brand new Android version of the Awesome Note app that has been wildly successful on iOS. Another first for the Note class will be the option to use the S Pen to control the capacitive menu/back buttons. 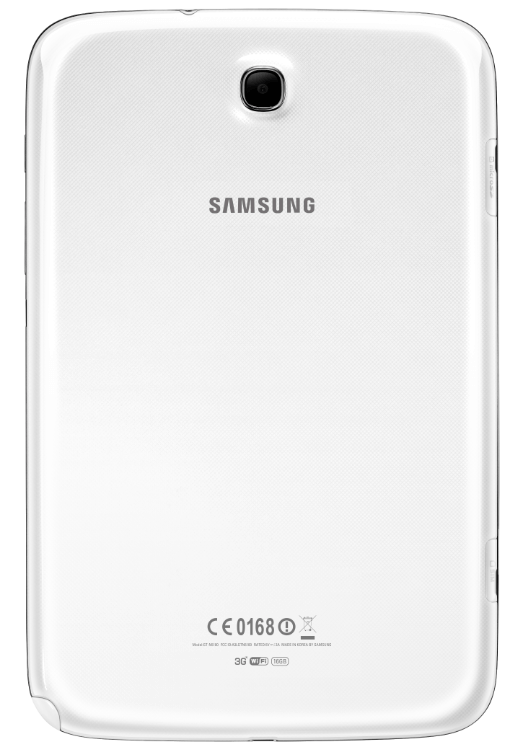 “The GALAXY Note 8.0 breaths fresh life into the category as it delivers the perfect fusion of portability and everyday productivity – the result is a pioneering, pocket-sized solution that enhances and enriches our everyday lives, whether at work or play,” said JK Shin, Samsung’s Mobile Communication President. Samsung plans to launch the Note 8.0 around the world sometime in the second quarter of this year. The company is planning on Wi-Fi, HSPA+ and LTE models, but has not yet announced US carrier availability. The real question here is whether Samsung packed enough under the hood and enough software features to entice users to choose this over the Nexus 7? Let’s just say for a moment that the Note 8.0 arrives on T-Mobile, anyone interested? this is getting ridiculous.. is this an 8″ phone?? really?? It’s a tablet, not a phone. Had you even read through the first paragraph, you would have easily ascertained that information. The HSPA+ version will be able to make calls like the Galaxy Tab 7.7 can. You can technically make calls from your laptop, too. I wouldn’t call that a phone either. EDIT: According to CNET, the international version will have a sim slot for calls. The US version will not. In other words, it’s a tablet for our purposes. inform yourself better..it IS A PHONE. Another person who clearly can’t read. Okay, it’s a phone. I give up. You win. err, it can make calls. it is the size of a tablet, but can function as a phone. technically, phablet again. just please don’t hold it up to your head. It doesn’t matter if it can make calls. T-mobile will block that functionality in the U.S. just like they did with the original Galaxy Tab. As far as T-mobile is concerned, it is a tablet and, if they offer it at all, they will only offer it with Data capability and no Voice. are you dumb? so my GSIII also has WiFi.. so according to your retarded reasoning is it a tablet with phone capabilities and not a smartphone? If the 8″note has a sim card w/phone number, proximity sensor, ear piece, microphones and phone app, receives direct calls.. it is a phone. Understood? No, I’m not dumb, but thanks for asking. It’s already been stated that the version coming to US will not have any of those capabilities you mentioned, hence NOT a phone. It is a tablet. Do you understand? EDIT: Had you took a little time to read through all the posts or open the link I posted, you would have known that. This is my nice response. Come at me with the personal insults again & I assure my next response won’t be. if this is priced competitively. id assume that the next nexus 7 variation will be released this summer. Thats the real kicker. Wow Samsung, you’ve outdone yourself here. Depending on the price, this is another genuinely good product! I don’t even know if this is a tablet or a phone. But 8.0 so I assuming it’s 8″ and that it is a tablet? Huawei Ascend Mate is a 6″ phone, Samsung Galaxy Note II is 5.5″ and the LG Optimus Pro G is 5.5″. Imagine if the Galaxy Note 8.0 was a phone? That would be insane. I’m sure it’s just a tablet. The back picture shows 3G and WIFI, and being as most newer phones come standard with 4G, it’d make sense for it to be a tab. So it’s a bigger Note 2 with a slightly different aspect ratio on the screen … cool device and all, but personally I’d rather have my Note II, I love how it can serve as a small tablet and still is a very manageable phone. If I preferred a small phone screen, I could see this being a little more appealing as a second device, but it’s kinda cool just using my phone for more instead of having 2 devices. earpiece, microphone and phone app.” Finally, a computer that takes calls. This is what I’ve been asking for in a smartphone, and it is finally here. But only the international one has a sim card slot. The U.S. ones won’t so you’ll have to use Tango, Skype or another app to receive calls. Let’s see if Nexus makes a Nexus 10 with a sim slot like the Nexus 7. I don’t see where it says that. Link to the info? In The article it said no US carriers have been announced to sell it so most likely we will get the wifi only version first and then maybe one of the carriers will sell one later. Obviously the wifi version will not have a sim card only the carrier version if one is released. So, y’all are guessing based on the lack of a type of information, then? You know it was just unveiled. American carriers are never around when a new phone/tablet/whatever is first announced. But I did say that a carrier or two will start selling them later. Samsung’s tablets since the original Galaxy Tab 7.0 have supported full phone+text capability on the international HSPA+ models. I have an international Galaxy Tab 7.7 and Galaxy Note 10.1. Both have full phone and text capability, however they are 3G quad-band (850/900/1900/2100) and do NOT have T-Mobile AWS 3G band (since that’s pretty uncommon outside US/Canada). If you live in a T-Mobile re-farmed area, you should be able to get HSPA+ speeds an any of Samsung’s existing tablets, international 3G versions. You can buy these RIGHT NOW at any of the importing sites – http://www.clove.co.uk, http://www.handtec.co.uk, http://www.negrielectronics.com, http://www.expansys.com – there are others, I’m sure. Love it. The software innovations on this pad are just over the top. They have incorporated the s-pen with even more apps then on the Note 2. This pad makes phone calls as well. I’m a big fan of this design, the home button is a feature I really enjoy and hope the SGS4 comes with it as well. This is the perfect size pad for the office and work site. This is one fast device. Samsung did a great job putting together a great pad with great features. I have a few new Samsung devices to save for in the next month. Thank You Samsung. PS It has wireless charging accessories. Its not a phone its a tab with call capabilities. Thank you, you can make calls from your car does that make it a phone? You hit it right on the head, a tablet with calling capabilities. Technically computers can all do this. I have noticed slow response to key strokes at times on my N7 too. At this point, they are just trying to make money off of the name. This is not impressive, and they know it. Keep the Note 2, and wait on something else. Step it up Sammy, step it up! So what you are saying. is that this is a phone and has a sim slot??!?! yes most definitely; why would you not just carry this around instead of a tablet computer and a phone. Who makes many phone calls any more.